Small bio-molecules, like lipids, metal ions, and carbohydrates, play vital roles in defining the physiological state of living organisms. The onset of disease is frequently associated with disturbances in homeostatic regulation of these bio-molecules, making them an obvious target when monitoring disease progression. Furthermore, the quest for unraveling fundamental biological pathways relies heavily upon the ability to precisely visualize strategic molecular players in vivo. Small molecule detection assays are usually limited to in vitro methods, during which critical information related to in vivo concentrations and states of bio-molecules is lost. The multitude of structurally and physically similar bio-molecules that might play very distinct roles in vivo makes small molecule detection both tricky and exciting. The challenge lies in designing selective, sensitive, and non-invasive molecular probes for the detection of bio-molecules. As part of the Chemical Biology group at TIFR, we work at the interface of synthetic chemistry, molecular biology, and imaging, to develop molecular probes which give a specific ‘ON’ response only in presence of the bio-molecule of interest. This unique ‘Turn-ON’ approach helps reduce the background signal due to non-specific interactions and dramatically improves detection. The design principles for most of our sensors are based on a careful scrutiny of natural protein and nucleic acid receptors for small molecules. Our group strategically couples nature-inspired ligands to imaging agents in order to achieve the selective ‘ON’ response. The current focus is on designing probes for optical and magnetic resonance imaging modalities which provide cellular and tissue level information respectively, or both as and when required. Engineering regulatory proteins for detecting bio-molecules is also being explored. Applying our ‘turn-on’ sensors for imaging biomarkers in vivo by choosing appropriate animal models is the ultimate aim of the group. 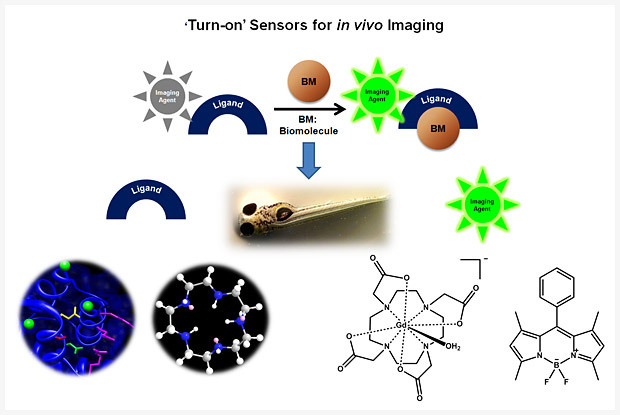 Our current research interests lie in developing sensors for in vivo imaging of metal ions involved in neurodegeneration and phospholipids implicated in various cell signaling processes. Sensors for monitoring enzymatic oxidation of substrates in atherosclerosis and pH sensors for visualizing autophagy are underway. We believe that using chemical insights to design sensors and applying the sensors to image bio-molecules can provide tools to expedite fundamental research in the field of biological sciences many folds. Our sensors have the potential to help decipher key links between molecular level information and physiological effects that result from the slightest homeostatic perturbation of essential bio-molecules. More information about our research activities can be found here.